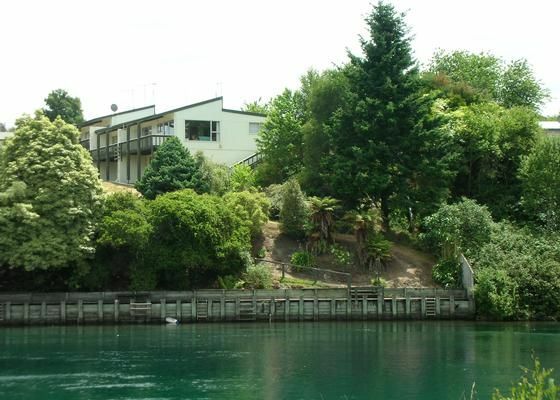 Enjoy staying at a comfortable self-contained apartment five minutes walk from central Taupo and 2 minutes from the nearest boat ramp. Suitable for small family group (4) using upstairs or extended family group or friends downstairs (another 5). Tie up your boat at the property's jetty on the Waikato River (Mouth of Lake Taupo). Walk down the end of the garden to hop on your boat or swim in the river or at the beach by the Marina. Sit on the sunny deck enjoying a barbecue while watching the kids play cricket on the expanse of lawn. Not suitable for parties as quiet area. Wifi and extensive DVD library and chrome cast to access your own netflix etc. We look forward to hearing from you! Two nights minimum stay throughout year. Five nights minumum stay over Christmas/New Year. 50% deposit to confirm all bookings. Special events times $150-$300 per night depending on season and number of people staying. Bedding such as duvets blankets, pillows provided. If you wish to hire sheets, towels, pillowslips and t-towels there is a $10 per person charge. Unlimited Broadband. Chrome Caste so you can access your Netflix, Lightbox or Neon by your cellphone. Large expanse of lawn. Jetty at end of property. This is on Waikato River and you may tie your boat up to this jetty for the duration of your stay. Five minutes walk into town. Large expanse of lawn. Jetty at end of garden where you have great lake views and can tie up your boat. I would recommend this property to anyone,the property was fantastic,walking distance to the shops,the river right there.i loved this property and hope to go back in the future. Great location walking distance to town. location by the river awesome, close walking distance to town. location by the river awesome, close walking distance to town. Apartment has all you need. Such a great location for the whole family. Such a great location for the whole family. The kids loved the secret stairs to the downstairs bedrooms! Very good location, property was exactly what we expected and made for a great stay. Very good location, property was exactly what we expected and made for a great stay. Spacious, clean and a memorable home for any holiday. We stayed as a group of four friends. We stayed as a group of four friends. An amazing location, close to town, and what a great place for bigger groups or those wanting separate bedrooms or two bathrooms as we did. The place was immaculate, had everything we needed and very clean and tidy. The cleaner or contact person was really helpful too. I would definitely book here again.